Flying cars would be awesome; however, we hope there isn’t a need for tall structures to rise above the smog! We’d much rather focus on lifestyle and how the Jetsons had almost everything at their fingertips. That’s why mixed-use properties come to mind. While we may not be zooming around in floating vehicles or have Rosie the Robot Maid at our beck and call, the success of our current economy relies more and more on convenience. Today’s companies sprout up and thrive merely by catering to the average lifestyle preferences of the people – a generation conditioned, especially over the last decade, for instant gratification. So, what is a mixed-use commercial building? And, why is it reaching new heights in popularity? Let’s find out why a Jetson-like life may not be light years away. Mixed-use commercial property refers to a sector of real estate that combines two or more uses within walking distance. This type of development provides the “live, work, play, gather” atmosphere in a convenient manner. Traditionally, the most common mixed-use properties combine residential and retail space which may include shops, restaurants, and other eateries. So, if you thought that brick-and-mortar retail space for lease is dead, you’re wrong! As we further transform into an economy that emphasizes comfort and ease, new combinations have evolved. For instance, office space and residential living have merged and even blends of residential, retail, and office. What’s Driving the Mixed-Use Commercial Real Estate Sector? Mixed-use commercial and residential development is a response to the lifestyle preferences of the most economically-active generations. The force behind the real estate sector’s growth has been the Millennial generation; however, the “one-stop shop,” instantly gratifying lifestyle is not only a claim by the youth. Baby Boomers have also gravitated toward real estate that offers expediency and walkability. The 2017 National Community and Transportation Preference Survey uncovered 62 percent of Millennials, 45 percent of Gen Xers and Baby Boomers, and 55 percent of the new Silent Generation prefer shorter commutes and want to live in walkable communities. Urbanization. Mixed-use urban development is most common in major metropolitan areas like Columbus, Ohio because of population density. Because of the influx of both Millennials and Baby Boomers, surrounding suburban areas are now becoming more urbanized. Bustling towns and lifestyle centers offering a variety of amenities within walking distance are more common, and more options will continue to pop up during 2019. As we touched on above, consumers are willing to pay a higher rent to be near town centers where they can walk to shop, pick up food, or even go to work. Changing Lifestyles. Shopping malls are no longer viewed as the ideal “one-stop shop.” Millennials, in particular, do not want to spend their money at major retailers or chain restaurants. Nor do they prefer car payments or lengthy commutes. Instead, more and more studies show that consumers search for locally-owned, specialty businesses. Small shops and local restaurants are all the rage today; younger people often prefer to travel by foot or via public transportation. Additionally, the new generation of workers tend to enjoy living as close to their jobs as possible. Demand for Rental Units. In tandem with the desire to live closer to their jobs, studies have also shown that people will pay more for a home when it’s within walking distance to other amenities. This demand has since shifted lifestyle standards for getting married and buying a house in the suburbs. Attitudes toward units within a mixed-use property for rent have become more favorable as people choose lifestyle over ownership. Tax Revenue Potential. When it comes to revenue per acre, mixed-use development brings in more taxes compared to single-use properties. Increased tax revenue results from a combination of factors. Mostly, urban mixed-use development projects tend to be vertical, meaning that each level is stacked on top of each other. When building up, there is less need for land. Taller developments also cost less for services such as water, sewer maintenance, and roads. Focus on Sustainability. Commercial real estate investors are beginning to address growing concerns regarding climate change. Commercial real estate investors are more considerate about the ecological and ethical aspects of new development projects. How a property can use minimal resources and run in a healthy manner is the focus in today’s market. From a CRE perspective, studies show that sustainable properties perform better over time when comparing asset and portfolio risk to unsustainable properties. What Do Mixed-Use Development Projects Mean for CRE Investors? Tenant attraction and retention. Since mixed-use is on the rise as a response to consumer demand, tenants are attracted to the shared space. Whether they are living, working, or gathering in the mixed-use property, the living space alone is enough to attract tenants and improve retention. Property owners and managers must find ways to infuse a sense of community, which mixed-use space naturally includes. Diversified portfolio risk. At its most basic, a variety of property types and uses reduce the risk of loss or failure as opposed to relying on a single-use property. For example, a mixed-use property can contain any combination of apartments, co-working space, a gym, and a coffee shop. If one unit, say the gym, happens to falter, there are three other businesses to recoup a potential loss. If a CRE investor is only working with a standalone office building or single retail storefront, the ROI is reliant solely on the success of that one business. Will Columbus Be the Next Orbit City? The City of Columbus and the surrounding region have seen an unparalleled boom in commercial real estate development. The team at The Robert Weiler Company has seen first-hand how mixed-use properties can transform a community. In 2013, HighPoint on Columbus Commons revitalized Downtown Columbus, combining the open space of an urban park with residential units as well as retail and office space. River & Rich, a project that includes 230 residential units and over 25,000 square feet of retail space, seeks to reshape the East Franklinton Creative Arts District. The new mixed-use urban development consists of a parking structure as well as an onsite fitness center and pool. River & Rich will be one of many East Franklinton projects that cater to residents who enjoy an easy walk to Downtown shops and eateries. University City Shopping Center, a community mainstay for decades, was officially demolished in 2018 to make room for a six-story mixed-use development project. The site will feature 266 apartments and over 120,000 square feet of retail, which will overshadow the one-story building that once housed the landmark Kroger location. Located near Ohio State University, the project will focus on a growing youth population, which includes Millennials and Generation Z. Get Mixed-Up in a Mixed-Use Commercial Property Investment! The rise of the mixed-use commercial property sector is moving at light speed! And, there are no signs of the market slowing down. So, why not make an investment? Hey, the Jetsons life may not be as far away as we once thought. At The Robert Weiler Company, we have seen it all over our 80-year history in Columbus, Ohio. Public trends and lifestyle preferences are continually changing, so it is essential to seek an expert CRE team with in-depth knowledge of the market. 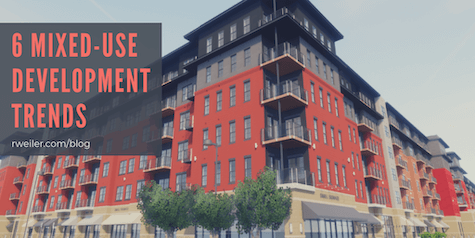 Speak with one of our dedicated associates for the advice you need to make a sound investment in mixed-use commercial property, or spearhead a mixed-use development project, by calling 614-221-4286.